At Destination Think!, our credo is that tourism can make the world a better place. When people travel, their minds open. They learn about other people, cultures, ideas and environments. Most of all, they learn about themselves. Travel can provide a new perspective that challenges travellers to think differently and change certain behaviours. Along the way, they create memories that they will carry with them for the rest of their lives. In many ways, visitors can also add value to the places they visit. They can connect with like-minded people. They can bring diversity, perspectives or a new exchange of ideas. They can decide to move to a place, study there, or open a business. They can increase the reputation of local brands. They can be a reason for greater environmental and cultural protection. They can be the reason for the infrastructure and amenities that residents enjoy. They can also bring intellectual, social, economic or – even more importantly – what Pierre Bourdieu calls symbolic capital to a destination’s residents. It feels good to live in a place that’s well known or popular. Given this potential for good, it’s extremely alarming that in some places the exact opposite is happening. Instead of improving the quality of life, tourism has, in some circumstances, become disruptive and destructive. Images of overcrowding have come to represent many problems related to sustainability and resident dissatisfaction in our news media. Even though the reality is often more nuanced, tourism often bears a lot of responsibility. Some popular destinations are loved to death while others suffer from mismanagement. Plenty of books and articles have been written about the causes, effects and impacts of overcrowding, which show that many other factors are at play. The impacts have resulted in a significant backlash against tourism from residents in places around the world. We have a responsibility as an industry to take this very seriously. Some of the leading thinkers in our industry advocate for a radical new approach to tourism as a whole. This change is often interlinked with the challenges we face globally, including gentrification, housing crises, the increasing gap between the rich and poor, and climate change. These leaders advocate that an economic system based on continuous growth is not sustainable and that it should be replaced with systems that will lead to a regenerative economy, where success is measured in balance with environmental, social, and cultural factors. These principles align with the arguments Kate Raworth makes in her book, Doughnut Economics. We at Destination Think! agree that it is necessary to move away from an economic system that is purely based on growth. We are more connected by a global ecosystem than a global economy. We have a moral responsibility to protect the places we represent. If that argument is not enough, we need to protect the assets that ultimately sustain a tourism economy. Trading our quality of life or environmental assets for money isn’t just morally wrong, it makes no business sense either. But where do we start? The call for change is aspirational but often comes with little specificity. Our clients are destination marketing organizations (DMOs). A DMO probably can’t change a global economic system. But it can do a lot by working within the current system and contributing to change. 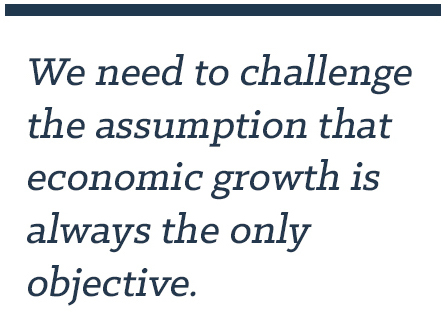 Principally, we need to challenge the assumption that economic growth is always the only objective. Instead, we need to look beyond economic objectives and include environmental, social and cultural objectives, because economic growth is a means to an end. Define the end and you will understand the means. Identifying and measuring these additional objectives is an important first step to managing economic growth responsibly. In order to operate a viable tourism economy, you need support from your residents. Anna Pollock called this your “social license to operate” in a recent Dutch documentary. You receive this license from your residents. Each place is different and subsequently, so is each license. Since your social license is symbolic, it doesn’t come with specific boundaries. However, we believe that you can analyze where the limits are, and find ways to affect them. For those of you who don’t believe your destination is anywhere near its upper limit, visitor pressure has often caught destinations by surprise. Every place has a tipping point. Think of the lily pond analogy. If a lily pad doubles in size every day, and it will take 100 days to completely cover the pond, when is the pond half full? That would be on day 99. On day 98, it’s only 25% covered. One day you think everything is fine, but two days later you’re left wondering what happened. This principle of exponential growth has caught many places by surprise. You need to manage your lily pond. You can grow the size of the pond, slow down, or even stop the growth of the lily. To know what to do, you need to understand where the limits of your social license are. Your residents are the only people who can tell you these limits. Do you ever have conversations about residents “not understanding the value of tourism”? That’s an early warning sign. Maybe they perfectly understand it, they just don’t like where it’s going. 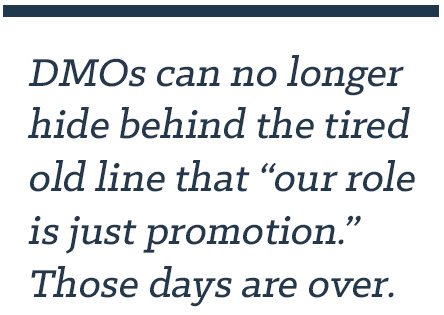 DMOs can no longer hide behind the tired old line that “our role is just promotion.” Those days are over. Have you been talking about destination development for a while? Well, now is a good time to get serious about it. Let your residents tell you what quality of life means to them. Understand how environmental and cultural assets can sustain and grow and flourish under tourism. How visitors can add value to a place instead of taking value away. This is the essence of destination management. It’s very different from what you’re used to. It requires new capabilities, research, processes, collaboration, strategies, systems and tactics. We have read too much lip service in DMO strategies. Sometimes, they say all the right things but do (almost) nothing. What we need is real action. Otherwise, one day, your lily pond will be full, and you’ll be left wondering what happened, both as a tourism professional and as a resident of the place you represent. This isn’t a burden, it’s an opportunity. Think about the positive impact you can have on your community as an organization and as an individual who cares deeply about the people and the ecosystem around you.